Amidst a busy and bustling holiday season, Southern Travel Agency’s founders Mike and Lauren Kerbelis recently took advantage of a quick window of downtime by retreating to Sandals Montego Bay in Jamaica. Built in 1981, this flagship location of the Sandals company also once served as the luxurious destination of Mike and Lauren’s honeymoon! Revisiting this classic all inclusive resort gave the couple an opportunity to both unwind and see how Sandals has expanded upon their first generation model. Read on to hear all about Mike and Lauren’s quick winter getaway and discover what’s new-and-improved at Sandals’ original resort property! Featuring a spacious yet intuitive floor plan, Montego Bay’s newest renovations include several Beachfront Swim-Up Suites, complete with private butler. Also among the innovative new additions is a magnificent over-the-water wedding chapel. During their stay, Mike and Lauren got to tour the new installation and envisioned how beneficial this stunning space will be for future honeymooners and newlyweds. 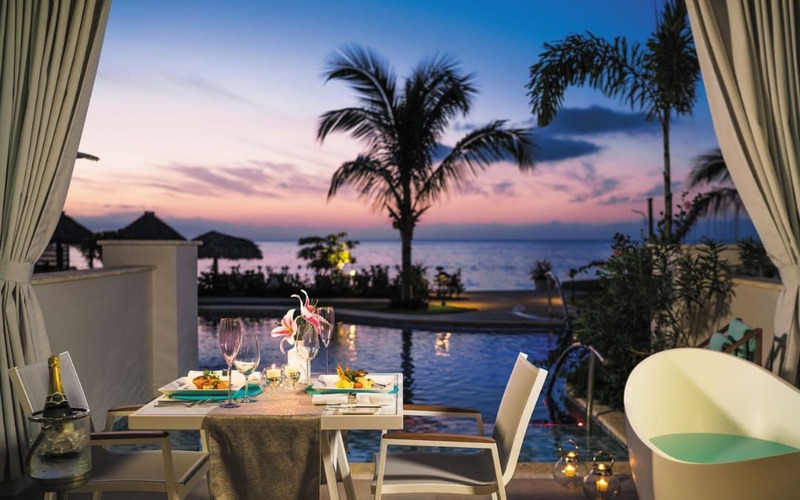 Globally inspired from Rome to Tokyo and everywhere in between, the five-star cuisine is an unforgettable part of Sandals’ all inclusive resort experience. With nine gourmet beachfront restaurants to choose from on-site, Montego Bay allows guests to savor flavors from every corner of the world, all while overlooking the Caribbean Sea. Mike and Lauren found themselves particularly impressed by The Jerk Shack, featuring a spicy, authentic Jamaican menu, and couldn’t resist indulging at Café de Paris, a Parisian pastry shop that can satisfy any sweet tooth. While new improvements have successfully brought the Montego Bay property to the forefront of the Sandals portfolio, the Sandals resort itself still retains a classic feel in its many elegant details. The piano bar from the original floor plan, for example, still stands as one of Mike’s favorite spots for nighttime atmosphere. Overall, Mike and Lauren reflect on the best part of their stay and describe the sensation of feeling tucked away from the world with no intrusions while simultaneously knowing that everything they desired was right at their fingertips. Ready for your own romantic getaway this winter? There’s no better place to chase the summer sun than at Sandals Montego Bay in Jamaica, nestled on the tropical Caribbean Sea — but our Southern Travel Agency team is ready to help you plan a custom experience wherever you want to go! Whether you’re considering a stay at a Sandals resort or have another dream destination in mind, contact us for a complimentary consultation and begin planning your romantic winter getaway today! Truly Pamper Yourself: Let Our Agents Build Your Dream Vacation Now!